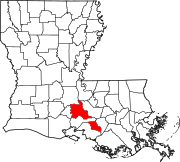 Location of Henderson in St. Martin Parish, Louisiana. 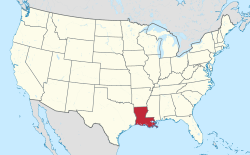 Henderson is a town in St. Martin Parish, Louisiana, United States. The population was 1,531 at the 2000 census. It is part of the Lafayette Metropolitan Statistical Area. Cajun Palms RV Resort in Henderson was rated in 2017 as the best campsite in Louisiana in a 50-state survey conducted by Msn.com. Also located in the town are Bernard's Apiaries, Inc., a honey factory, and the Henderson Bible Church. According to the United States Census Bureau, the town has a total area of 1.7 square miles (4.4 km2), of which 1.6 square miles (4.1 km2) is land and 0.1 square miles (0.26 km2) (2.89%) is water. Per the 2000 census, 49.3% speak English, 37.8% French (including Cajun), and 12.9% Vietnamese. As of the census of 2000, there were 1,531 people, 546 households, and 408 families residing in the town. The population density was 914.8 people per square mile (354.0/km²). There were 596 housing units at an average density of 356.1 per square mile (137.8/km²). The racial makeup of the town was 72.37% White, 9.93% African American, 0.20% Native American, 16.72% Asian, and 0.78% from two or more races. Hispanic or Latino of any race were 0.39% of the population. There were 546 households out of which 39.9% had children under the age of 18 living with them, 53.1% were married couples living together, 15.0% had a female householder with no husband present, and 25.1% were non-families. 21.8% of all households were made up of individuals and 9.5% had someone living alone who was 65 years of age or older. The average household size was 2.80 and the average family size was 3.24. In the town, the population was spread out with 29.8% under the age of 18, 9.5% from 18 to 24, 28.7% from 25 to 44, 22.3% from 45 to 64, and 9.7% who were 65 years of age or older. The median age was 33 years. For every 100 females, there were 98.1 males. For every 100 females age 18 and over, there were 92.3 males. The median income for a household in the town was $21,295, and the median income for a family was $22,891. Males had a median income of $24,265 versus $17,583 for females. The per capita income for the town was $13,907. About 24.2% of families and 29.5% of the population were below the poverty line, including 44.7% of those under age 18 and 25.6% of those age 65 or over. Henderson relies particularly heavily on fines and forfeits to pay for basic services. In 2013, Henderson collected $3.73 in fines and forfeits for every $1 it collected in taxes. Public schools in St. Martin Parish are operated by the St. Martin Parish School Board. ^ "The best campsite in every state". Msn.com. Retrieved June 9, 2017.